The Consumers Road Business Park and areas at the intersection of Sheppard Avenue East and Victoria Park Avenue provides a place of work to over 18,000 employees, and is one of Toronto’s most concentrated areas of office jobs. The area is also the location of significant residential growth, with over 3,500 residential units approved, under construction, or occupied in the past ten years. Meeting the needs of residents and workers requires investment and options for active transportation, public spaces and community services. More office and residential growth is anticipated in the area. To manage the growth, support employment uses, and to direct investments into broader community improvements, the City of Toronto is undertaking a study of the area called ConsumersNext. ConsumersNext will set out a new planning framework to support continued employment investment and intensification in the Consumers Road Business Park, residential uses, community facilities, a street and block plan, and public realm improvements to serve resident and working populations. The ConsumersNext study area is almost 100 hectares in the areas of North York and Scarborough. The technology to convert the map on this page to an accessible format is not currently available. The map may not be compatible with screen reader software. If you are unable to access these maps please contact the planner. The Planning study will form the basis for a Secondary Plan and Urban Design Guidelines for the Study Area. The Economic Potential Study component of ConsumersNext will recommend strategies, tactics, incentives and amenities to attract and retain businesses within the area and to identify what actions and policies recommended for the Consumers Road Business Park may be transferable to other office-based Employment Districts in Toronto. 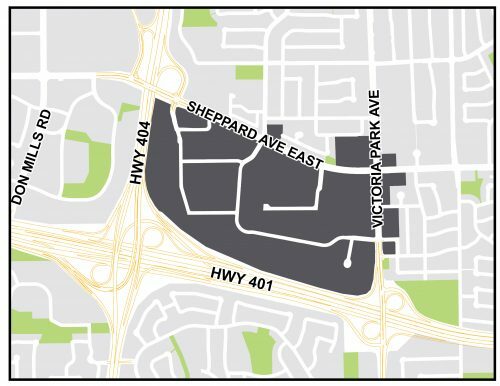 The Community Services and Facilities (CS&F) Strategy for ConsumersNext will evaluate the existing capacity and gaps in community services and facilities for the area bounded by Finch Avenue East, Warden Avenue, Highway 401 and Don Mills Road. The CS&F Strategy has a larger area than the ConsumersNext Core Study Area to reflect the service boundaries of City facilities (such as Libraries or Recreation Centres) and community agencies (such as non-profits serving local community needs). In conjunction with the area planning study, the CS&F Strategy will assess projected growth and change in the ConsumersNext planning area, and identify priorities and implementation tools to help meet current and future social infrastructure needs.